It is hoped this type of alternative funding could be introduced as part of the EU’s Entrepreneurship 2020 Action Plan. This week we were proud to host a workshop at the Malta Financial Services Authority to discuss the potential introduction of investment-based crowdfunding in Malta, in addition to the rewards-based crowdfunding and donation-based crowdfunding that already exist on the island (through Zaar). 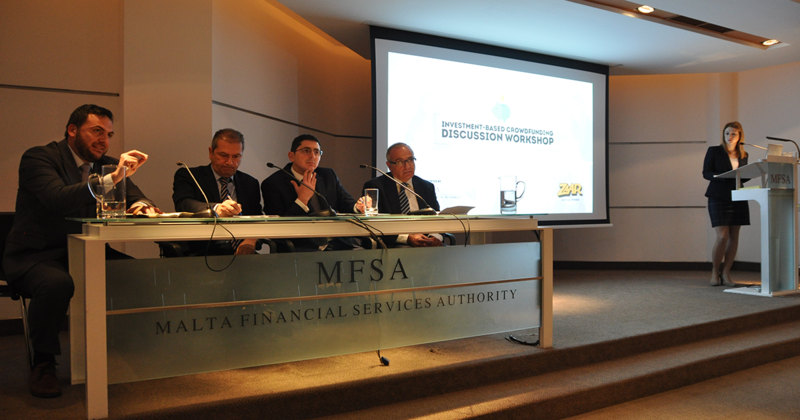 The workshop was open to the public, and featured input from our manager Matthew Caruana, Grant Thornton partner George Vella, director of the Regulatory Development Unit at the MFSA Dr Michael Xuereb, analyst within the Regulatory Development Unit at the MFSA Dr Emaliese Lofaro, and Malta Business Bureau CEO Joe Tanti, as well as comments from entrepreneurs and stakeholders. The workshop followed the MFSA’s recent release of a discussion paper on the topic, which will close on 31 January. Explaining why crowdfunding is so important, Matthew, who has overseen many successful crowdfunding projects at Zaar, explains that it can help eliminate the funding gap for start-ups and SMEs. “Crowdfunding can offer unique support for budding and existing entrepreneurs on multiple levels. No other investment form, be it debt or equity, can provide the benefits of pre-sales, market research, word-of-mouth promotion, and crowd wisdom without additional cost,” he says. Speaking after the workshop, MFSA Chairman Prof Joe Bannister, said that: “Crowdfunding has a lot of potential that could be harnessed to the benefit of the Maltese economy. The MFSA Discussion Paper has provided us with the opportunity to take a good look at the nature of the investment crowdfunding business, as distinct from other types of regulated activity, and consider whether a more customised regulatory regime is called for in the situation. “This exercise is meant to allow the MFSA to home in on the practical objectives and take a regulatory approach that would facilitate its growth as an alternative form of financing for start-ups and SMEs, while providing an alternative investment option for investors,” he says. For more information about the MFSA’s Discussion Paper on investment-based crowdfunding and to give your input, please contact us on matthew@zaar.com.mt.